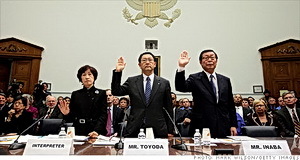 After an exchange of pleasantries that included praise from committee members for his willingness to step into a lion’s den, Toyota President and Chief Executive Officer Akio Toyoda, and Yoshimi Inaba, president and chief executive officer, Toyota Motor North America, drew heavy fire from both Democrats and Republicans for the company’s slowness in dealing with safety defects in its autos and trucks that led to deaths and eventually the massive recalls. Florida Republican John Mica held up a document showing Toyota celebrating $100 million in savings by avoiding a broad safety recall, saying they make this a “very embarrassing day” for the company. The document being referenced is the July 2009 internal Toyota memo that listed the issue as a “win” for Toyota. The document says Toyota was able to save $100 million by negotiating a more limited recall with the government in 2007 over floor mats. Currently there are three US congressional investigations concerning incidents of sudden unintended acceleration blamed for more than 30 US deaths and tied to the recall of more than eight million Toyota vehicles worldwide. Lawmakers and some drivers who survived crashes they blamed on the defects have charged the Japanese auto giant with ignoring complaints and incorrectly blaming accidents on floor mats that jam accelerators or on sticky pedals, while ignoring the possibility of software or electronic problems. “My name is on every car. You have my personal commitment that Toyota will work vigorously and unceasingly to restore the trust of our customers,” he said. He delivered his short remarks clearly in somewhat accented English. However, when the questioning session began, he switched to Japanese with the help of a translator. On Tuesday, Toyota’s top US executive, James Lentz, told another House panel the company’s moves to pull some 8.5 million vehicles off the road — six million in the United States — had “not totally” addressed the problem. Lentz said the company had found no evidence of an electronics problem being to blame but, under heavy fire from angrily skeptical US lawmakers, admitted Toyota had not completely ruled that possibility out.